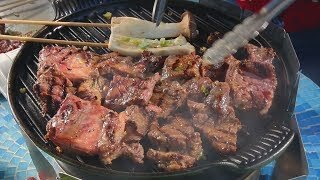 Today I’m going to show you how to make Korean galbi (grilled short ribs) using a very simple marinade that’s fast, easy, bright, light, and delicious. I learned this style from the owner of a popular Korean restaurant, and he has long lines of customers! The traditional Korean name for this dish is galbi-gui (gui means grilled and galbi means ribs) but most people just call it galbi for short. A few years ago I showed you how to make LA Galbi, which uses a more traditional marinade compared to today’s recipe. The traditional way takes longer, uses more ingredients, and tastes different, too. Many of my readers have tried it over the years and loved it. But when I learned this new way I was so surprised at how easy it was, how delicious it tasted, and what a beautiful presentation it makes before grilling, I couldn’t wait to share it with you guys! I like both styles, depending on the situation. In this recipe and video I’ll also show you the traditional cut of meat we use for galbi and how to handle it. 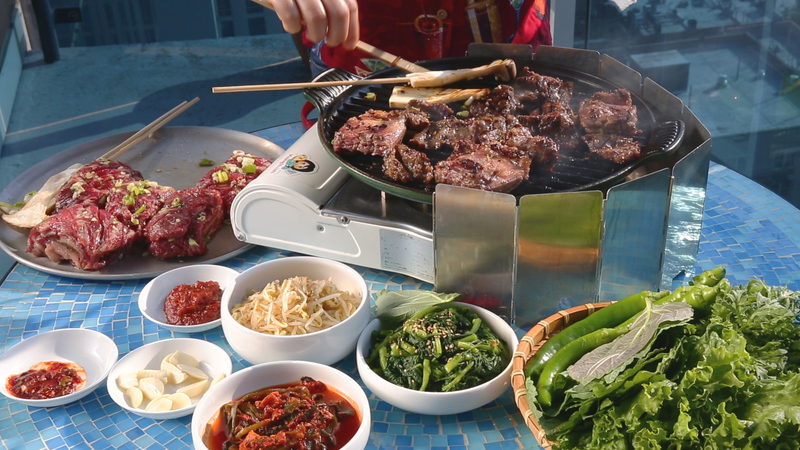 LA Galbi is made with a different cut which is much simpler, just a section of the ribs cut across a few bones. It’s already thin and you can just marinate it and grill. The traditional cut uses a section of a single rib with a big thick piece on meat on it. It takes some time, skill and care to prepare it before we grill it. 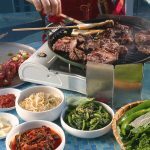 You could easily mix and match between the two recipes: choose the cut of meat you have, and the marinade you want, and make Galbi! Combine sugar, salt, and ground black pepper in a bowl and mix well. Rinse the ribs in cold water to remove any blood and remaining bone fragments. Drain and pat dry with paper towel. 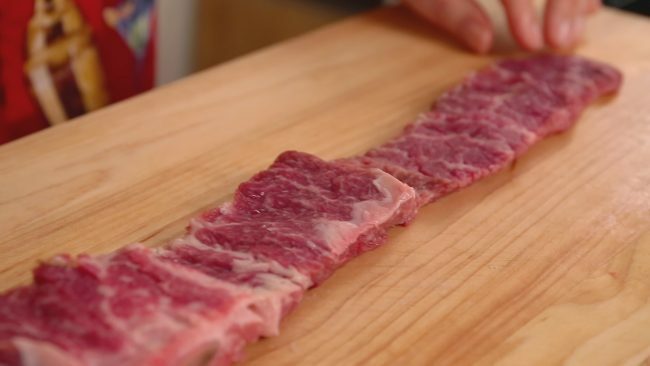 Place a rib bone-down on the cutting board, with the thick layer of meat facing up. Cut into the rib just above the bone. Don’t cut all the way through, leave a kind of hinge on the side so you can flop the large piece of meat over and it’s still attached to the bone. Flatten it out, flip it over, and then cut into the big chunk of meat about a quarter inch from the cutting board. Cut the same way, leaving a hinge on the side, and then flop the meat over. Keep flipping, cutting, and flopping until you make a long flat strip of meat about a quarter inch thick. It should still be attached to the bone. Lightly score both sides of the meat and the sides and edges of the bone. Do this for all the galbi and lay them on your cutting board with any other vegetables you’re going to grill. Drizzle sesame oil on the meat, including the bones, and any vegetables you’re going to grill. Rub and slap in with your hand to coat evenly. Sprinkle the marinade powder evenly all over the meat and the bones. Add the garlic and green onion to the meat and pat down. Grab a bone attached to the meat and roll the meat in gently. Place the rolled beef short ribs on a platter or tray. Repeat it with the rest of the marinated beef short ribs. Cover with a plastic wrap and refrigerate at least 1 hour up to 12 hours. Heat up a grill over high heat and the ribs. Unroll them onto the grill so they lay flat. Flip the ribs over a few times until both sides are golden brown. The meat is very thin so it shouldn’t take long. Be sure not to burn them! Serve with lettuce, perilla leaves, vegetables and ssamjang (dipping sauce). Koreans always serve with rice and a few more side dishes too, like sigeumchi-namul and kongnamul-muchim, to round out the a meal. Eat ssam-style, by wrapping a piece of meat in the lettuce with a piece of raw or grilled garlic, ssamjang, and whatever else you have and then popping the whole piece into your mouth at once. You can add rice, too. Sitting around the grill, everyone wraps their own morsels, one at a time. Have fun! Posted on Friday, June 23rd, 2017 at 5:57 pm. Posted June 24th, 2017 at 7:55 pm | Log in to reply. Hey Maangchi, thank you for this variation! I’ve always used your soy based wet marinade, but it never turned out like the restaurant. I’ve never seen a galbi recipe done this way, looking forward to trying it. This recipe was originally posted on June 23, 2017 at 5:57 pm by Maangchi. The video was watched 743,521 times on YouTube & has 17,389 likes!